We also have run smaller Workshops so students can play together. 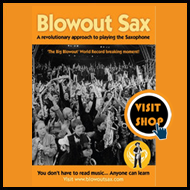 A cluster of Blowout saxophonists were whipped into shape with harmonies, arrangements, and solo skills to produce a massive saxophone sound with the aim that The Blowout Sax opened the Bath Festival at The Pavilion in spectacular style. Over the years we have also run other workshops. 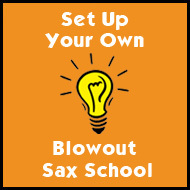 Here for example was a session we ran a little Blowout Sax workshop involving many saxophonists who weren’t part of Blowout Sax but were interested to come along. 10.30am-11am Arrival and Set Up. 2.45-4 pm 'George 1' with Craig. 'Perfect Day' with with Mark. 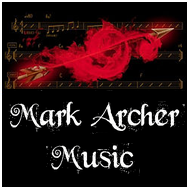 With a big energy performance of all 4 pieces to finish. Exclusive and limited to 40 players. The best description of this is from journalist Tony Staveacre. In 2006 the city of Bristol celebrated the 200th birthday of Isambard Kingdom Brunel. 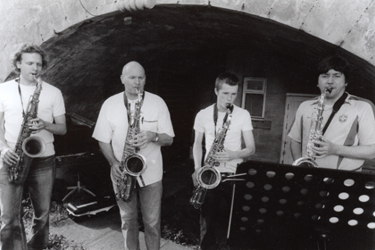 Bristol’s top saxman Andy Sheppard was commissioned to devise and direct a suitably magnificent musical tribute to IKB. 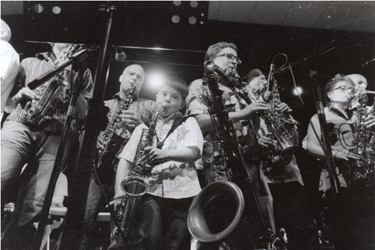 He, with the help of many Blowout saxophonists recruited and directed a 200 west country sax players to form a saxophonic choir: and over a very short but very intense rehearsal period created a well organized and polished ensemble. The big noise for the big night: Andy’s piece was an original composition for massed saxes and combined grand fanfares, electronic soundscapes and reggae riffs, Mexican waves and layered chords over which the leader improvised his own virtuoso solo over 'Happy Birthday' while rockets exploded in the night sky and a fiery waterfall cascaded into the Avon Gorge. Andy was hugely aided by Craig Crofton of Blowout Sax who played a major part in the actual performance playing and conducting as well as alongside Andy in the many workshops . Thanks to Tony Staveacre and BBC..